I have to apologize for the lack of wine reviews this week. Between my various birthday celebrations, the beginning of softball season and other work-related stuff, I've just not had much time for drinking...or taking notes about said drinks. I'd love to be able to tell you that I'll catch up on that this weekend...but that would only be a half truth. I'll be drinking alright...but few notes will be taken. I'll be drinking...probably in excess...but it will be fun. I'm heading to Atlantic City Saturday morning with seven other guys...playing a round of golf, checking into the Borgata and then who the heck knows what will happen...all for my bachelor party. 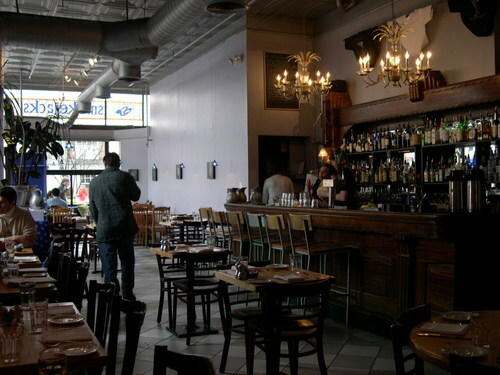 If you ever find yourself in Burlington, Vermont and in need of a great little restaurant for interesting, locally-grown food and an interesting (and impressively long) by-the-glass wine list, Smokejacks on Church Street is for you. We loved it so much, we we ate there last Saturday for lunch and again on Sunday for brunch. It seems like there are new wine blogs popping up every single day. I'm afraid that my "Wine Blogs" list on this site is a bit behind and outdated. So, if you have a wine blog and would like to be added, shoot me an email and give me a nudge. 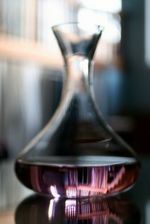 Thanks to Tom from Fermentations, I came upon winewaves this morning...a great wine blog that focuses on tasting notes. Some nice camera work too. If only Jerry reviewed some NY wines...it'd be perfect. Despite some Long Island Railroad issues and slow subway service that resulted in us getting home just before 3 a.m., Nena and I had a great time at Windows On Long Island last night, at Capitale in Manhattan. The space there is gorgeous. 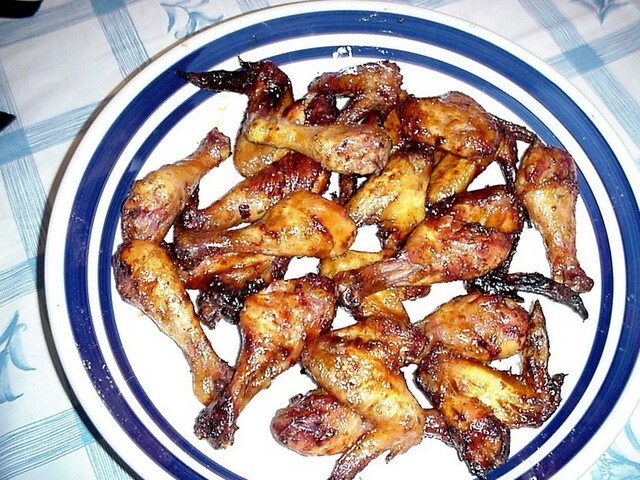 The food was inventive and delicious. And, as expected, the wine was great as well. So where's the pictures? That's a fair question, but, as much as I love my digital camera...it has one serious design flaw. You actually need a memory card in it for it to work. And, well...I forget the stupid card. No pictures...which disappointed Nena because she wanted a picture with the foodie from Queer Eye For the Straight Guy and Anita Lo of Annisa (and Iron Chef America). Nena loves celebs...that's for sure. Next year, I hope to gather some friends and get them to go to the event as well...it was a lot of fun and I'm already looking forward to next year. Everywhere might be a slight exaggeration, but I always smile when I see a Long Island wine on a wine list outside of New York. 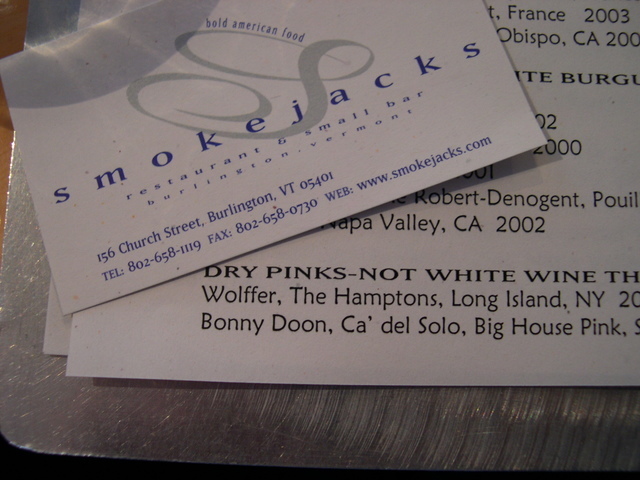 As you can see above, Nena and I stumbled upon the Wolffer Estate Rose at Smokejacks in downtown Burlington, VT...right next to an offering from Bonny Doon. Of course, we didn't order it...we've had it before (and it was the 2002). Wolffer's 2004 Rose should be out any day now. That's where Nena took me for my birthday...and we had an absolutely great time. Thank you, honey! The weather sucked...but we stayed in a beautiful, historic bed and breakfast, the Willard Street Inn, had two great lunches at Smokejacks (yes, we enjoyed it so much Saturday we went back Sunday), enjoyed a beyond-amazing dinner at Trattoria Delia, and discovered a great wine bar, WineWorks. I've got pictures of most everything (except the dinner)...including the car we rented (a new Mustang convertible that only had 650 miles on it). Doesn't Nena look good behind the wheel? Of course with all the rain, we didn't have the top down much. But, it was sunny as we were driving tot he airport, so we got to enjoy it a little bit. 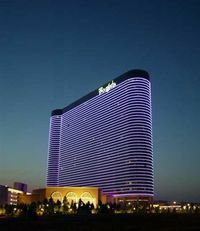 It's going to be a busy week with Windows on Long Island tonight...my birthday celebration with friends tomorrow night at Cooperage Inn and then my bachelor party beings Friday in Atlantic City. When I think of Martha Clara Vineyards, named after Martha Clara Entenmann (of Entenmann bakery fame), three things always come to mind: their jam-packed events calendar, their large and inviting tasting room, and Bernie, the Jack Russell terrier that adorns their Rose wine label. I’ve always wanted a bit more from their wines, which while potable haven’t always been distinctive. But I’ve long been a fan of their Ciel dessert wine, made with Viognier and Chardonnay. It’s one of my favorite Long Island after-dinner drinks. And, while the Bernie-bottle Rose isn’t to my liking, the Rose of Cabernet Franc is excellent. Beyond that, I’ve not always been impressed. Now that I’ve tasted some of their recent and upcoming releases, I’ve learned that they are making some nice, and occasionally great, wines at Martha Clara. Unfortunately, their best wines are rarely on the free tasting menu at their tasting room, and the average visitor probably doesn’t want to spend up to $10 for a full glass of one of the reserve wines when that same $10 gets them five tastes of five reserve wines down the road at another winery. Of the winery’s new whites, which include a unique 2003 Semillon ($15) and a decent, but not great 2003 Chardonnay ($13), the Martha Clara Vineyards 2003 Estate Selection Gewurztraminer ($21) was the best. More fruity and slightly less refined than some other Long Island Gewurztraminers, it still shows nice acidity and citrus and spice flavors along with the typical floral and lychee nut aromas. While refreshing ice cold, I liked how its flavors evolved as it warmed. Gewurz is always a good choice for spicy Asian cuisine and this one is no exception. The famed 2001 growing year (one of Long Island’s best ever) resulted in some of the best Martha Clara reds I’ve ever wrapped my tongue around. 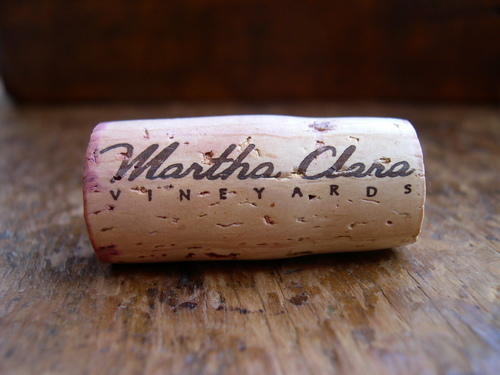 The Martha Clara 2001 Cabernet Sauvignon ($20) is a soft, berry-filled red with toasty, soft tannins. This is a very nice every-day style Cabernet that would be great if priced closer to $15. If you’re like me and like a bit more heft in your Cabernet, the rich Martha Clara 2001 Estate Selection Cabernet Sauvignon ($30) fits the bill. Expertly balanced, this wine brings together toasty oak, full blackberry and blueberry fruit, well-integrated tannins and a wonderfully lingering finish. The winery expects to release this wine to the public in June. Syrah/Shiraz is very popular nowadays, but I find the few Long Island versions I’ve tried innocuous and uninteresting. 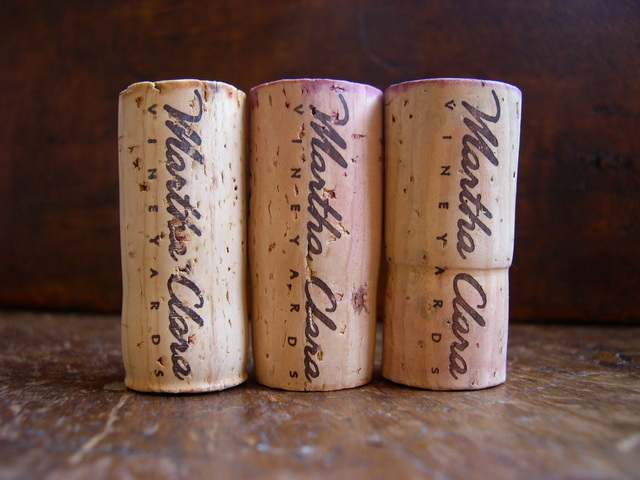 The Martha Clara 2001 Estate Selection Syrah ($26 and also slated for a June release) is an exception. Ripe and distinctive, it is fruit-forward like many Aussie versions, but its blueberry and blackberry flavors are framed by soft tannins and accented by sweet spice, vanilla and smoky hints. Martha Clara’s 2001 6025 Meritage ($40) blends 33.5 percent Merlot, 25 percent Syrah, 16.6 percent Cabernet Sauvignon, 16.6 percent Petit Verdot, 8.3 percent Cabernet Franc and builds on the delicious success of the 2000 6025. The inclusion of Petit Verdot in this year’s vintage gives it a beautifully deep, dark color and additional tannin. The wine is medium-to-full bodied and opulent with jammy berry and toasted marshmallow. It’s my favorite of the new wines. Let it breathe and you’ll be rewarded with increased complexity and aromas. This wine has good aging potential as well, so pick up a few bottles to drink and a few to lay a couple down for a couple of years. 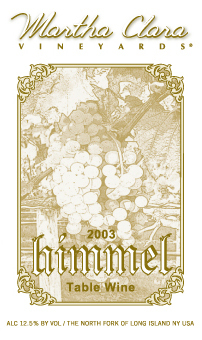 The final wine in my tasting was the 2003 Himmel ($31), a succulent, fresh dessert wine that is sixty-six percent Riesling and thirty-four percent Gewurztraminer. Sweet but not cloying, it’s filled with stone fruit flavors and is well balanced with crisp acidity. I think I might like this post-dinner sipper even better than the Ciel. 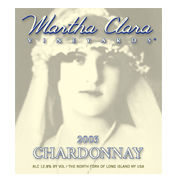 For more information on Martha Clara Vineyards or to order wines, visit www.marthaclaravineyards.com or call 298-0075. Don’t forget, Windows On Long Island is Monday, April 25 at Capitale in Manhattan. Attend and you’ll have the opportunity to taste wines from more than 30 Long Island wineries paired with food from some of Manhattan’s best chefs. Tickets are $125 or $250 for a VIP pass that includes a 6 p.m. to 7 p.m. preview with reserve wines. Proceeds will benefit Earth Pledge, a nonprofit environmental organization. For tickets, call (212) 725-6611 or visit www.earthpledge.org/windows. 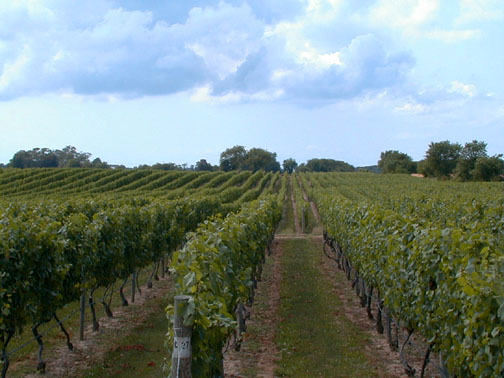 Chardonnay is the most-planted variety on Long Island. Just about every winery makes it at least one bottling, and many have several. If you've been reading LENNDEVOURS long, you've probably seen me use "Long Island-style Chardonnay" to describe some of the better ones. They aren't quite as crisp or minerally as the best white Burgundies, but they aren't flabby, buttered-oak California wines either. Martha Clara Vineyards 2003 Chardonnay, doesn't quite fall into my definition of Long Island-style Chardonnay...but that's not necessarily a bad thing. And, this isn't necessarily a bad wine at all either. Eyes: This wine is golden in the glass, but not nearly as deeply colored as you might expect if you drink a lot of California Chardonnay. Based purely on visual appearance, I wondered if this was a steel-fermented. It's actually 70% steel fermented and 30% French oak fermented. Nose: Here'se where the oak's toastiness and vanilla make their first appearance. In fact, I didn't get much fruit at all on the nose at first. The wine was way too cold. As it warmed, more citrus fruit joined the toasted marshmallow aromas. Tongue: Again, it was too told at first and it tasted a bit flat. But, as it warmed, this medium-bodied white showed some nice citrus-tinged apple and some sweet oak/vanilla. It had some freshness to it, but not enough acidity for my palate. The finish was a bit short as well. Overall: Much like their 2003 Gewurtraminer, this is a nice wine, but for the price, you can probably do better, even on Long Island -- but I'd not turn it down at a party. I'm betting that this wine is pretty popular with less-nerdy wine drinkers though. Continueing on with my review of Martha Clara Vineyards' recent and upcoming releases, we move onto my favorite of the whites, the 2003 Estate Reserve Gewürztraminer. 100% estate grown, the vines produced less than two tons per acre. The ripest grapes were hand harvested and meticulously sorted to ensure that only the best ones were used. They were pressed gently and the juice was immediately chilled to 50˚F. After settling, it was fermented at 55˚F in steel tanks leaving less than 1% residual sugar (12.7% alcohol by volume). Only 75 cases were made. Nose: Nicely aromatic with citrus and lychee on the hose. Not complex or overly spicy, but appealing. Tongue: The first sip was actually a bit harsh, with acidity and alcohol teaming up to really tingle my tongue. But, the second was very fruity, more so than most other Long Island Gewürztraminers. While not as crisp or light bodied as the Gewurtz offerings from The Lenz Winery or Corey Creek Winery, it still offers some acidity along with its ripe, juicy fruit flavors and subtle sweet spice. The residual sugar was barely noticeable. I also picked up on something a bit nutty in the medium finish. Definitely better as it warms up, so I'd only chill it for 45 minutes or so. Food: I always say I like Gewurtz with Asian food, and this one is no exception. This would be particularly good with spicy dishes because of the little bit of residual sugar and all the lush fruitiness. It might also be good to serve to your wine newbie friends. Overall: I like my Gewurtz dry and super spicy so, for my money, I'd probably go with one of the other Island Gewurzes before this one, but I'd certainly not pass it up if offered to me. And, I'd definitley serve this at an Asian-themed party to people unfamiliar with white wine beyond Pinot Grigio. Next Tuesday (the 26th) I turn 30, and because Nena is so wonderful, she's respected my wishes and hasn't planned some huge bash. That's just not my style on my birthday. Instead, she's planned a trip somewhere for the weekend...just the two of us, which is something we don't do often enough. But, she won't tell me where we're going. All she's told me is that we can't be out too late Friday night at happy hour with friends (also for my birthday) because we need to be up at 7 a.m. to drive to the airport. On my birthday itself, I know that we're going to Cooperage Inn with the usual suspects (Liz, John, Jenn and Al) to celebrate, but I only know that because I picked the restaurant. I guess I only turn 30 once...so three celebrations seems acceptable, right? Over the next few days, you'll be reading a lot about Martha Clara Vineyards' wine here on LENNDEVOURS because I've sampled eight of their recent and upcoming releases in the last week or so (for a column on them). Martha Clara Winery's owner, Robert Entenmann, named his wine making venture after his mother, Martha Clara Entenmann in 1995. You might be asking yourself why Entenmann sounds familiar...well that's because these are the same Entenmanns that deliver baked goods to the "end of the aisle" at your local grocery store. Actually, the family sold the bakery business in 1978, and moved to the east end of Long Island to grow potatoes (a lot of our vineyards used to be potato farms) and raise horses. In 1995, Robert caught the wine bug and planted 18 acres of grapes...and the vineyard eventually grew to 112 acres. Martha Clara Vineyards released their first wine, a 1998 Viognier, in September 1999...and they've been churning out wine ever since. 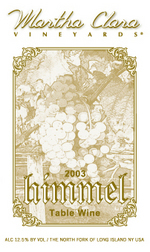 This wine, their 2003 Himmel (Himmel means "sky" in German), is a dessert wine made from 66% Riesling and 34% Gewurztraminer (100% estate-grown fruit). The grapes were frozen, resulting in high-sugar juice (40 brix) which was gently pressed at a yield of 60 gallons per ton. The juice was cold fermented at 55°F for three months. Malolactic fermentation was not allowed to completely run it's course. The resulting wine is 13% alcohol by volume and has 10 grams of residual sugar per 100ml. Only 95 cases of 375ml bottles were produced and the wine was released in January 2005. Alder of the uber-wine blog Vinography has posted on the the Best Restaurants in the World for 2005 as chosen by Restaurant Magazine in the U.K. I had to admit...I've not eaten at any of those listed...but with a few only an 90-minute train ride away...perhaps it's time for that to change. Anyway, it's an interesting list...check it out. I don't claim to have any real photography skills, but I do usually take my own pictures for my Dan's Papers column. I'm working on a round-up of Martha Clara Vineyards' recently released and soon-to-be released wines...and I think this is the one that will run with it. I like it, so I thought I'd share. JULY 2006 UPDATE: Both Great Rock Golf Club and Blackwells have new ownership and management. As such, this review may not reflect current the current dining experience. I've only eaten at Blackwell's once since new management took over, so I don't feel like a new review would be a good one. However, the food, service and overall experience was a million times better. I'd recommend Blackwell's again without reservation. Once I've eaten there at least one more time, I'll write a new review. Last summer, I wrote a review of Blackwells Restaurant in Wading River, NY. I thought the restaurant showed great promise and it was a place I looked forward to frequenting. Great atmosphere, top-notch food and, at the time, great service. The restaurant closed for a while over the winter months as it (and the attached golf course) underwent some renovations and upgrades (new management). But, it re-opened in late March and we tried it Friday night with Liz and John (who had their rehearsal dinner there last June). I doubt any of us will ever go back again, and Liz and John used to go a couple times a month. Getting sick of the red-themed WBWs? I know some are...so next month we're gonna keep things a bit ligther with May's WBW host, the always entertaining Sam of Becks & Posh. After three straight editions with red wines as the theme, it's spring...so rosé is our theme for Wednesday, May 11th. With so many new roses coming out on Long Island in the next few weeks (2004 vintage), chances are I'll be 'forced' to drink more than one. This should be a fun edition of WBW...so start looking for your pink drinks! Any questions...ask Sam...she's running the show this time! Spring is here and now that we’ve all at least started our spring yard work, it’s time to put aside our chores and relieve some of that cabin fever we’ve all been feeling. I’m sure it will come as no surprise that I think there’s no better way to enjoy a spring afternoon than a trip to the wineries. Whether you’re new to visiting winery tasting rooms or a seasoned vet, here are a few tips to help you get the most out of your trip. Choose a Designated Driver. Sure, the samples you’ll be drinking are small, usually an ounce or so, but they do add up. Decide who’s going to drive before you head to the first winery. Don’t assume that “someone will be sober enough to drive” at the end of the day. Nothing ruins a great day at the wineries like a DWI arrest, or worse. If you don’t want to designate a driver, hire one of the limo or bus companies to drive you around. Don’t Try to Visit Every Winery. Again, those little wine pours add up. Choose three or four wineries that you’d like to try and take your time at each one. Wine tasting is about more than just the wine. Rushing because you want to visit every winery on the North Fork in one day takes away from the experience. Don’t do it. Bring a Picnic Lunch. One of the things I enjoy most about a winery afternoon is having a picnic lunch among the vines. Many wineries have beautiful patios or decks where you can spread out and have a great lunch. But, if you’re going to drink wine with lunch, make sure it’s from the winery where you’re eating. In most cases, they’ll even lend you glasses. It’s rude to drink wine from another winery on someone else’s property. Don’t Wear Perfume or Cologne. This might just be a pet peeve of mine, but if I’m tasting a winery’s newly released Merlot, I want to be able to smell the berry aromas with subtle hints of cocoa…not the cologne the guy next to me has drowned himself in. You’ve met that guy. I know you have. Be considerate. Speak Up and Ask Questions. Once you’re bellied up to the wine bar, don’t just quietly drink what they pour for you. The people pouring the wines are passionate about them and have a lot to offer. Again, a winery visit is about the full experience, not just the wines. And, if you get lucky, they may just pour you something special that isn’t on the usual tasting menu. Get to know these people, they’ll remember you the next time you visit. Don’t Drink Wines You Don’t Like. If you take that first sip of a reserve Chardonnay and it’s just too oaky and buttery for your taste, don’t finish it. Every tasting bar has a dump bucket for just this reason. It’s okay to skip any of the wines on the tasting list too. If you want to just taste a particular varietal or just reds or whites, you can do that. Bring Friends and Have Fun. I always say that wine is something best enjoyed with friends. Get a group together and have a great time (with a designated driver, of course.) But remember that you aren’t the only people out there. Try not to be too loud or annoying. It ruins the atmosphere for everyone else. Buy a Bottle to Take Home…If There’s One You Like. Some people say you absolutely need to buy at least one bottle of wine at each winery. That’s ridiculous. Never feel pressured to do so. Of course, if there’s a wine you really love, why wouldn’t you want to take some home? Remember, wineries want you to have a great time so that you’ll come back again and again, not feel guilty and never return. Well folks, another vintage of Wine Blogging Wednesday has come and gone...and wasn't it fun? All told, 26 wines were reviewed...with generally positive results. I don't think I'm alone in my plan to look to Sicilian wine more often...especially with Italian food! 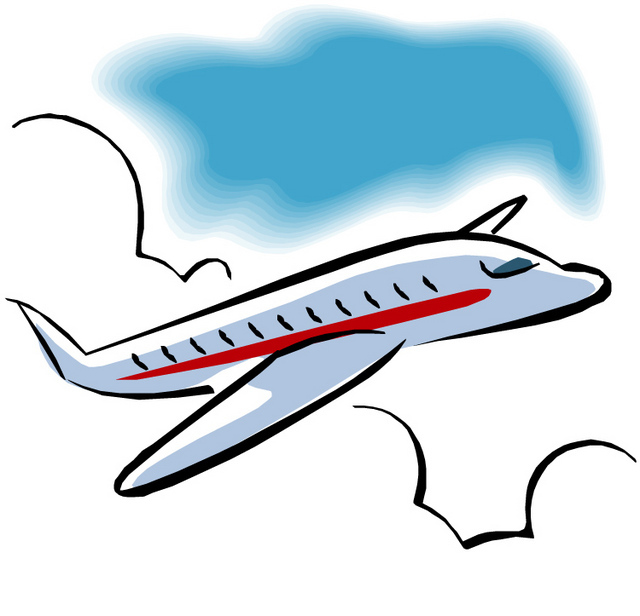 I'd like to thank Ron and Katia of the appropriately named blog Love Sicily for hosting the virtual event. To see the full round-up, visit their blog. For May's edition...keep an eye on your favorite San Francisco-based blogs. I'm not going to tell you who's hosting just yet...but I'm glad to have her on board. It's no secret that Long Island produces its share of wine. 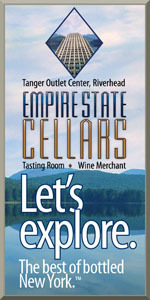 You can find local labels easily in stores, and wine tasting on the East End has become a popular activity. Some of the wines are good, and others aren't, but if you look hard, there's a select group that is truly world-class. 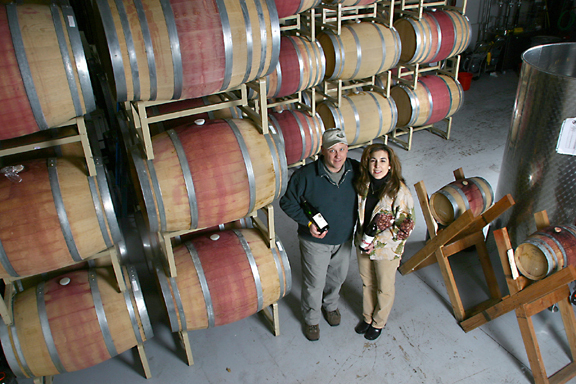 The LI wine region, born in 1973 with a single vineyard, has grown to now include more than 60 vineyards and 30-plus wineries. If you've tried LI wines before, chances are you picked something up at your local wine shop—probably a sweetish blend with a cute, water fowl-adorned label, or a gulpable, second-label wine from one of the larger producers. If you didn't like them, you're not alone. These wines sell extremely well, but they often lack the elegance and character of the world's best wines. If that's all you've tried, you haven't even tasted LI wine yet. The fact is, LI produces wines that compare favorably with those from the top winemaking regions in the world, like Bordeaux, Burgundy, Alsace and even Austria and Hungary. You just need to know where to look, and most of the time, your local wine shop isn't the place to find them. Here are 10 wines, five white and five red, that are made in such small quantities by smaller wineries, they are sold mostly to restaurants, upscale wine shops and in their own tasting rooms. Each is worth the trouble of tracking a bottle or two down. 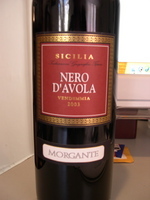 Nero d'Avola, Sicily's most popular and famous non-fortified wine, is one I first tasted a couple summers ago -- in Orlando's Epcot Center of all places. After a morning of dodging rain showers Nena, my parents and I were ready for lunch. So, we ducked into the Italian village and had a nice lunch at L' Originale Alfredo di Roma Ristorante. My mother is 1/2 Sicilian and Nena and I are both part Sicilian as well, so when charged with picking our wine, I chose the only Sicilian on the list...a Nero d'Avola. It was delicious...and extremely food friendly (I always find Italian wines to be among the most food-friendly out there). So, when Ron chose Sicilian Reds as this month's Wine Blogging Wednesday theme, I was torn. On one hand, I knew I liked Nero and would probably have a good experience. But, on the other hand, I like to use WBW as an excuse to explore and branch out. What other reds could I find from Sicily? Could I find a Sicilian Primitivo? What about a Frappato or a Gaglioppo? I also know that international varieties like Merlot, Cabernet Sauvignon and even Syrah are being grown there now as well. As I continue to catch up on all the happenings from last week, Alder of Vinography (one of my favorite wine blogs) offers nice commentary on the James Beard Writing Award nominees for 2005. It is certainly great to see an Internet writing category...and I share Alder's hope that maybe blogs will get a sub-category some day. I'm not going to hold my breath...I think we're still seen as "renegades" in a way...because we don't have a "real journalist" serving as an editor...but no blogger I know would ever want it any other way. As you'll see in his post...he challenges wine writers in particular to raise the bar on the overall quality of wine writing in the world. I'll accept that challenge. I agree that there needs to be an infusion of passion back into professional wine writing. Maybe the fire has waned for full-time wine writers...so it's up to those of us that do it either part-time or for fun to pick up the slack. Ron of LoveSicily is hosting this month's vintage of Wine Blogging Wednesday...and it's in two days! The the theme: Sicilian Reds. It should be a fun one...I'm curious to see what people come up with beyond Nero D'avola. I have to admit...I haven't bought my bottle(s) yet...but I will tonight if I have time. Spread the word...and keep your eyes peeled for an annoucement about May's WBW theme! When you think of world-class BBQ, does Brooklyn, NY pop into your head? No, not usually. But, Robert of WhiteTrashBBQ sure is trying. He's on a quest toward "producing award-winning, competition-busting, real barbeque." He's a Long Island native now living in Brooklyn and I like how his site his shaping up. He hasn't been at the blog thing long, but there's already a bbq chicken recipe I want to try...and some cool how-to pictures of indirect grilling on a Weber kettle grill. If I were a betting man (and I am), I'd expect to see some collaborative work that brings real BBQ and real wine together...stay tuned. I got quite a few emails last week asking if I saw the pieces in the New York Times on Long Island wines. Of course I did! I read Asimov every week and I'm beyond pleased to finally see him turn his eyes just slightly east to Long Island. But, as someone who drinks and writes about Long Island wines a few times a week, I'd like to comment on some things he says in these two pieces. If you’re at all like me, then you like to drink wine every night with dinner — which can get pretty expensive if you’re drinking twenty-plus dollar bottles. 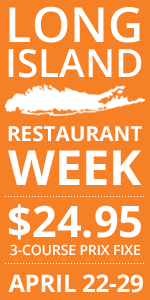 Long Island’s top wines aren’t cheap, there’s no doubt about that. But, there’s an easy, and more affordable, solution — second label wines. Second label wines aren’t wines made by second-rate producers. On the contrary, they are well-made, less expensive wines made by some of our region’s top winemakers. They usually have a different name, different labels and — this is the best part — lower prices. So, if these wines are so good (and many of them are), why are they so much cheaper? It’s quite simple really. For their top or first label wines, winemakers tend to select the best grapes from the best blocks in their vineyards. Often labeled “reserve” winemakers often spend much more time working with these wines. And, the wine often spends more time in newer oak barrels, which boost the price too. Second label wines, on the other hand, tend to be blended wines from lesser grape lots, designed to be consistent year in and year out. But, in a year with optimal growing conditions the grapes that go into these wines can be almost, if not as good as those for the best wines. These are almost always wines for people who want to drink their wines instead of save them. While Nena was shopping at the craft store for lace and pretty bows (or whatever else one shops for there), I went next door to a wine shop I've visited once or twice. I was browsing around...mouth watering over all the wines I'm still unable to drink for at least five more days...when I saw one of our favorite LI white wine values...Macari Vineyard's Early Wine. And, it was on sale for ten bucks. Anyway, I was reading the "shelf talker" about the wine and thought I recognized some of what was printed on it...and then I saw "-- Lenn Thompson, Dan's Papers" under it. That's right...I'm being quoted on shelf talkers now. Not bad...not bad at all.